Kimberly Olsinski received her Bachelor of Arts, with honors, in History and Sociology from the College of William and Mary, where she completed her degree in three years. She attended Hofstra University School of Law, where she graduated in the top fourteen percent of her class. At Hofstra, she participated in the Law Reform clinic, and was an editor of the Labor and Employment Law Journal. Mrs. Olsinski has completed a ten-day intensive seminar emphasizing effective trial advocacy techniques. While in law school, Mrs. Olsinski worked for the legal department of a big insurance company. Upon graduating, she switched sides and began exclusively working on behalf of injured people. Since moving to Charlotte, Kimberly has worked for two personal injury firms in the area. While an associate at those two firms, she gained experience and knowledge on how to successfully handle all types of personal injury cases. 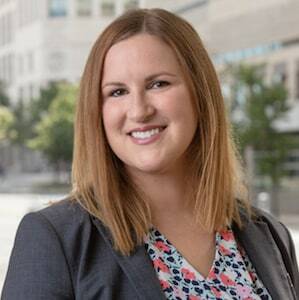 Kimberly is married to Justin Olsinski, and she enjoys spending time with her family and friends, playing with her dog, reading, playing soccer, and volunteering with the Humane Society of Charlotte.